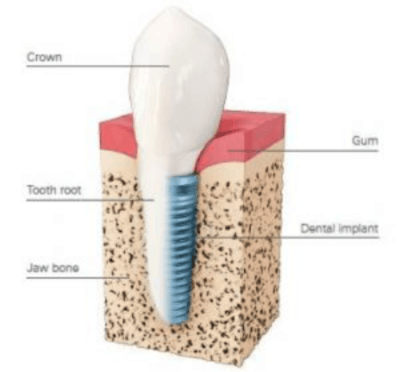 Dental implants are screws made from titanium, a metal that is known for its compatibility of the human body and its ability to bond to bone. The titanium screw is placed into a prepared socket in the jaw bone to replicate a tooth root and left to fuse (Osseointegration). This healing phase is important to provide a strong, stable foundation for the restoration that will replace the tooth on top. A special attachment called an abutment, which is fitted to the top of the implant forms the external connection for the new replacement tooth (crown) or teeth (bridge or denture). While our skilled clinicians will try to save teeth where possible, there may come a time to consider whether a tooth should be replaced with an implant. Dental implants may be necessary when you have missing teeth and you cannot have, or do not want dentures or bridges. Also, dental implants have a number of important advantages over conventional restorations. Dental Implants function in the same way as natural teeth. There are no difficulties with eating or cleaning the teeth. Healthy adjacent teeth do not have to be filed down to act as supports for the missing tooth or teeth. Dental Implants maintain the bone height beneath the replaced tooth. The chewing forces that are transmitted through the implant to the bone stimulate the natural process of bone renewal. Preserved bone height helps to maintain a good appearance, both of the restored teeth and of the face. Dental implants are suitable for almost everyone however, as it is important that your’s bone tissue is fully developed, therefore they are not considered for under 18’s. Your mouth must be in a healthy condition, with no untreated tooth decay or active periodontal disease. Your oral hygiene must also be of a high standard before treatment is offered. Good quality and quantity of bone and healthy gum tissue are also desired but there are preliminary treatments which can help. Our periodontist will evaluate your gum and surrounding bone tissue to assess your suitability. The various treatment options will be discussed and bone augmentation and grafts can be considered if you have little sound bone to ensure a successful implant placement. There are some other medical conditions that rule out the use of implants include blood clotting disorders; certain bone diseases, deficiencies in the immune system and severe systemic illnesses. Dental implants have a predictable success rate of approximately 98%. Our specialist periodontist is best placed to evaluate the condition of the surrounding gum and bone tissue to ensure a predictable and stable result. With 3D digital imaging, the accuracy of the treatment planning and placement is far improved; aiding the success of our dental implants. There is a significant risk to the success of dental implants if they are placed in an environment of active periodontal disease. An infection could develop around the implant, which will lead to its failure and loss. So it is imperative to only place dental implants in a healthy environment, which we can help you to achieve as part of your tailored treatment plan. The long-term success of implants depends on good plaque control, you will need to spend a bit more time on your oral hygiene regime once you have a dental implant. You’ll also need to attend a few follow-up appointments with your dentist, hygienist and/or periodontist so that the implant can be monitored and steps can be taken to prevent any complications at an early stage. We are also highly unlikely to place dental implants if you smoke. Smoking affects the healing process and greatly reduces the success of dental implants. Quitting smoking will significantly increase your chances of successful implant therapy. CAN I FINANCE MY TREATMENT? At Holland Park Dental Centre we understand dental implant surgery can be expensive. So, we offer a number of finance options available to help make your smile affordable. We also ensure that our pricing encompasses all that’s required to replace your missing tooth. You can finance all treatments from implant surgery to implant restoration. We have a number of 0% interest options with variable deposits. Book a half-price Dental Implant consultation now!